The Seventh Doctor Sylvester McCoy intros the concluding chapter of PodCulture’s 500th Episode celebration. With Christina Skyping in via the Xbox One and joining the in-studio crew of Adam, Glenn, Brad, and Cristalle wrap up the wacky fun of the 500th episode recording. The Gang powers up with Geek Cuisine #1 – Tangerine Red Bull! Cristalle has her turn picking the FLASHBACK segment and of course she picks what has become one of the most infamous Geek Cuisine segments…Cuttlefish Jerky! 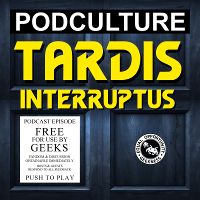 Of course that just leaves Brad to pick his favorite FLASHBACK segment and he chooses a TARDIS Interruptus segment…where Brad and Christina sit down, have tea, and interview the Fifth Doctor Peter Davison! The PodCulture crew then close out the show and thanks everyone for listening for 500+ episodes. Dead or alive you’re coming with us! RoboCop Peter Weller intros episode 502 of PodCulture. The entire crew is in-studio (and Christina via Skype on the XB1) and talks a ton of TV and DVD Talk. 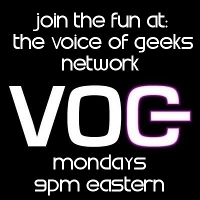 Cristalle tries and gets the crew drunk on a Sour Beer for this episode’s Geek Cuisine. It is Glenn’s turn for the FLASHBACK segment and it isn’t hard to guess what his choice was…of course it is the infamous RoboVampire! 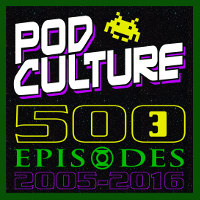 After an introduction by every Browncoat’s favorite leaf on the wind Alan Tuydk; PodCulture keeps the 500th episode party going with Part B! Brad, Glenn, Adam, Cristalle, Andy, and (skyping in from Cleveland) Christina kick back in the living room with the Zoom H4n and kick off the show with TV and DVD Talk. Cristalle gets the in-studio crew all liquored up with an all-new boozy Geek Cuisine; Hazelnut Liquor.